Every action makes me twitch with nerves. I'm nervous enough that my responses are a bit slow and I'm second guessing myself with each movement. My last showings in artillery ships have been poor. Instead of avoiding it and moving to a tackle position I decided to push past my issues and not default to my familiar comfort. I like the FC even if I am not comfortable with him as a FC yet. I do not know his voice, his manners, his terms, and all of the dozens of little things that come from constant work under a FC. But, I am comfortable enough to do what he wishes and lose ships under his orders. But, my shyness kicks in. My lack of confidence in my abilities. Its time for deep breaths and one foot in front of the other. I hate disappointing the FC and I feel disappointing right now. We took a wormhole to adventure. Off we go into new space. We immediately have to divert, avoid a frigate gang and then plunge into null to go to some station. I've not kept up with what is going on in null sec. People are fighting. Something will eventually happen. The amount of propaganda all of the groups are spewing out has tinted everything to subversive attempts to sway the audience. I find null sec uncomfortable, still. But, there we were, warping to a station. Everything seemed fine. I had heard the optimal and I was worried I had misheard. If I died I'd die and well it happens. Still. I'm uncomfortable there and found myself in warp. Due to my over caution at moving around mixed with my other worry that I was mishearing the gates even though my autopilot was set I was a knotted ball of stress. And as I'm entering warp, TiDi slams into the system and a Mega fleet appears on the station? We landed and were told to burn away and warp. TiDi was only at 27%. Warping through molasses gives you plenty of time to drop safe spots. We landed on the other gate at range, which was good, because Wolf fleet. Sigh. Possibly rail megs. Wolves. Awful situation for Arty Tornados. More bouncing and we decided to head out and roam somewhere else? Cloud ring? We were in Cloud ring? 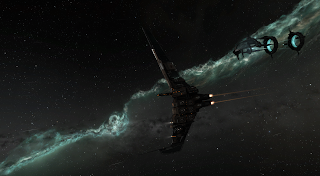 Back through faction warfare space. I'm not used to it as well. Frigates everywhere. I felt like everything was going to land on me and kill me. I know lots of people solo roam in Tornados. I'm going to assume they had a better clue about what is going on with the ship. I'm clinging to my optimal in my head. I hope I have it right. I don't know. I want to learn this but so much of my history has been tackle and brawling. I feel rawly new. I've also failed at arty every other time I have flown it. I refuse to forget to move. I watch distances. I don't know what is going on and everyone else's comfort with the area and situation is making me feel very, very, very incapable. We extracted. Naoru got caught, the rest of us got out. As we are extracting, I am trying to pay attention to where we are. We are somewhere in Syndicate. I know nothing about this place. Every single system has a mass of numbers and letters for the names. I seem to be the only one without a clue as to the area. They were discussing various paths and systems on coms until I finally ask them to shut up with the system name chatter until I have caught up or our autopilot was accurate about where they wanted to go. Everyone else is perfectly comfortable in null sec and their ships and what they are doing. I may be the stupid and inexperienced one in this but I have finally gotten up the courage to ask people to shut up and make themselves clear when I don't understand them and with new system names and random letter/number combos I need clarification. It used to be that I would sit in silence and get lost or ask in private chats. Now, I keyed up and made demands. A lot of it was frustration from not knowing where I was or where we were going. I felt that I kept missing the orders that everyone else heard so well. All I knew was that this entire area is a bubble soaked land and I still loathe bubbles. Everyone says that null sec is empty. Yet, I rarely ever seem to find that. When I have tried to venture in on my own I spend hours camped in systems and warping from point to point. Gates, celestial, and other objects are bubbled. Fleets that always seem to be the perfect thing to kill what I am flying come in. I suspect it is just an exaggeration of the negative experiences I often experience in null sec. Everything changes just enough to toss me off of my stride. Interdiction Bubbles are an interesting point of distaste for me. It is catch bubbles that drive me so crazy and the fact that anchored bubbles can just be left to rot in space. The mad dash to avoid fleets while avoiding bubbles becomes crazy and I just want to rage at them. They are left everywhere. It seems something that should be in some way, tended. But at the same time, I am incredibly biased against them. I cannot say that my thoughts or opinions on them have any rational or sensible ground as that they are born of pure emotion. I find them terrible. Anchored bubbles are the sole reason I hate going into null. I know people love them. I know people think bubble camping is amazing. I know that null sec is no rules and it is supposed to be fantastic. I still find little joy in it. For fleets, I will go. Beyond that, I have not yet found null a place I want to spend my game time. Maybe one day. Maybe not. I'm tired of waiting for an epiphany that may never come. I'm trying to take new situations and events. If I stay in a Jaguar forever I will stunt my growth and I do long to be a more confident and competent combat pilot. I'm not one to fall under the drugged allure of DPS. The Tornado is reasonably graceful and agile for what it is. I did not find it unpleasant to fly. I just found not knowing what to do with it unpleasant. That, however, will improve with time and for now when I get the chance to use these ships and these fits I am going to step into my discomfort zone bit by bit. I may not be able to convince myself to undock in a ship and go out and solo roam but I can put up my comfortable ship and expand my skill set. I hate null too...only for slightly different reasons. Mine have more to do with Sov and a different specific mechanic. I lived there once, for a few months... It was the first time I ever went over 1 billion ISK in my wallet that I made in game... and I hated every second of it. You are so beholden to others... the few who sit at the top and don't know or care who you are. In Empire you are just one of the faceless masses, in null you are one of the faceless drones... in Anoikis... in Wormhole space, you are known to all and a bro or you are a target... I talk with my Alliance Exec everyday... how many in the Swarm can say that? We have all the good things of Null... great PI, mining, and the best possible Rats with none of the crap I hate so much in Null.. the teeming mass of mouth breathers, the RULES and my personal pet-peeve mechanic... Cynos. There are no hot-drops in holes... Ambushes yes, hot-drops of Fleets warped in from several systems away, nope. So, get podded in a hole and you are effectively out of the fight for the night... no reshipping no, warping back in to the fight... and that is made very highly probable with bubbles. And an entire stack of reasons listed why I have no interest in wormhole space. As you said, what is one man's interest is another's boredome. Much of sov null is empty. Npc-station rich null like syndicate is not. We were in the CFC main staging system at first, by the way. The one they are using to launch their Fountain invasion. Always amuses me to take less than a dozen pilots to a system with 400+ and still manage to pick off a few targets.